Join us for the annual tree planting ceremony organized by the Environmental Quality Commission to raise awareness of trees and the importance they play in our environment. 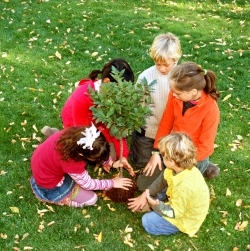 Participants from the Boys and Girls Clubs of the Peninsula's after school programs will assist the city arborist, Environmental Quality Commission, Mayor Pro Tem Cecilia Taylor and Mayor Ray Mueller in planting a tree in honor of Arbor Day. The tree is a deciduous Columbia sycamore (Platanus acerifolia 'Columbia').